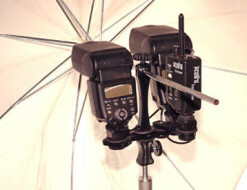 Double Strobe Dolly, and Y cord, 2 thumb screws with rubber washers. 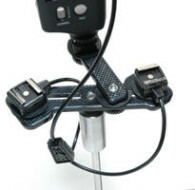 This bracket and cable will give you a one stop increase in light when using two flashes (at maximum power on manual), by setting both flashes at half the required power, recycle time is cut in half from what it would be when using only one flash. This Pocket wizard can be hung with the lanyard. 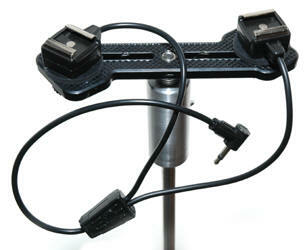 The arm to hold the transmitter can be ordered later if you decide to.